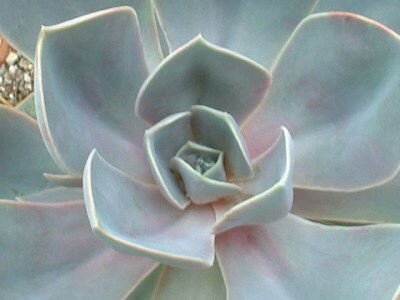 Echeveria 'Perle von Nurnberg' has to have the most commonly mis-spelled name - I've seen it listed as pearl van nurmerg, perl von nurberg, and many other variations. Echeveria 'Perle Von Nurnberg' is a hybrid between Echeveria gibbiflora 'Metalica' x E. potosina (now E. elegans) created by Richard Graessner of Perleberg, Germany in the 1930's. The lovely mauve metallic foliage make this an unusual and highly coveted plant. Ultimate size is about 15cm (6-7") across, and tends to get leggy with age, growing longer and longer with a rosette of foliage on the top of a bare stem. Best conditions are bright, with quite dry soil. Propagates easily by leaf cuttings, and when the stem gets bare, just cut off the rosette and leave it on the surface of the soil to root. This is known as beheading, and is easier than it sounds. You can get a good new plant from one that has outgrown itself, very quickly. Use as a specimen to contribute its lovely subtle colour to your collection.